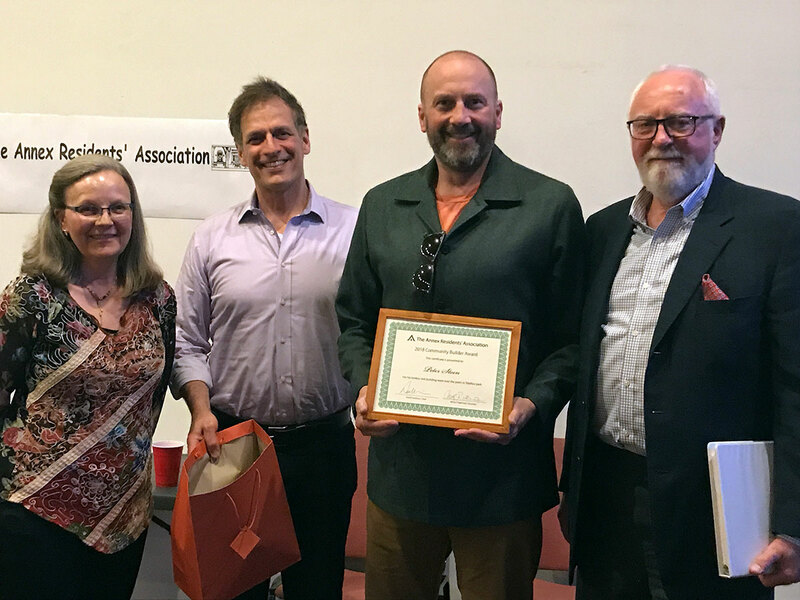 Development and politics were the main subjects at the Annex Residents’ Association (ARA) annual general meeting at a packed Friends’ House (60 Lowther Ave.) on April 26. Former Member of Provincial Parliament (Parkdale-High Park) Reverend Cheri DiNovo was this year’s keynote speaker. Known as the “queen of the tri-party bills,” she sponsored many private member bills that had the support of the three major political parties, like the one in 2007 that raised the minimum wage to $10. Now a minister at Trinity-St. Paul’s United Church, she hosts Radical Reverend, a radio program on CIUT 89.5 FM, the University of Toronto’s campus radio station. The ARA also announced the winner of the Community Building Award, Peter Steen. He was recognized for building and maintaining an ice rink at the Jean Sibelius Square Park on Kendal Avenue since 1998. Created last year, the Community Builder Award is given to an Annex resident who makes a significant contribution to the neighbourhood. “It is an honour, it is a really sweet thing and I appreciate it,” said Steen. He wanted to make sure that all those in the community who helped him over the years were acknowledged too. It was “always appreciated” as it’s “never one person’s work, there was a lot of help”. Steen says that he always loved hockey, which was his motivation to build the rink. He has also seen the popularity of the sport grow in the neighbourhood in the past few years. Steen added that a family will take over the task of maintaining the rink, and that there has been growing interest in the community rink over the past couple of years. Finally, Joe Cressy (Ward 20, Trinity-Spadina) spoke about how the city is doing very well economically, but still has to address things like homelessness. Cressy spoke about the downtown core’s growing population and said that more people will work and study downtown. He said this shows the need for better transit and “livable neighbourhoods” marked by new parks and community centres, adding that the design for a new public park at Spadina and Sussex avenues will soon be released. Another topic Cressy addressed was fraternities and sororities, which he said should be licensed as multi-tenant housing, something he brought to Toronto City Council’s executive committee last year. “This is entirely about ensuring, when you have large multi-tenant houses, that they are helped, that they are safe, and that they are good community neighbours,” he said. Cressy also spoke about the changes to the ward boundaries, which has created three new seats at city council. What is now Ward 20 will be split in half. The north part will become Ward 24, and run from Queen Street to the rail tracks just north of Dupont Street, bounded by University Avenue on the east and Bathurst Street on the west. The southern part will remain Ward 20, and run roughly from Queen Street to Lake Ontario, bounded by John Street on the east and Bathurst Street on the west. On May 23, Toronto City Council voted to amend the city’s by-laws so that fraternities and sororities may be required to be licensed. Annemarie Brissenden, contributing editor, is the president of a not-for-profit corporation that owns and operates a women’s fraternity house on Madison Avenue. She edited this article.